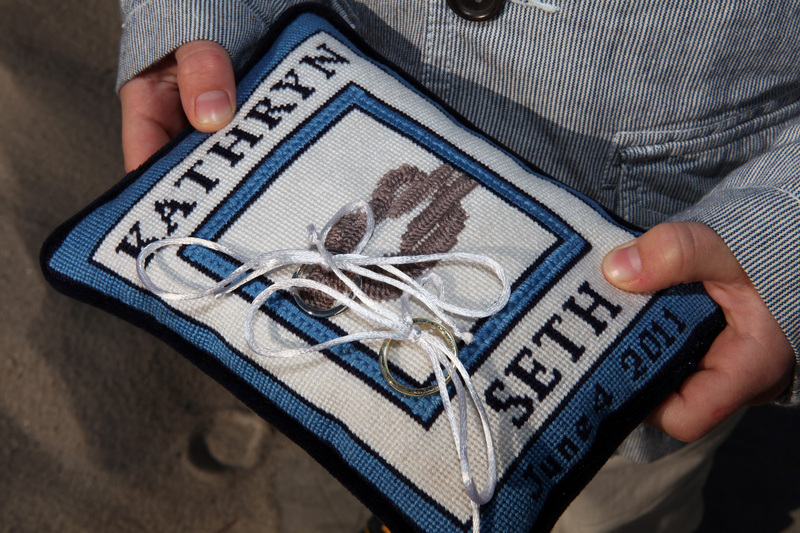 One of our March Posts was Seth’s ring bearers pillow. I was out of town and he was going to take on the needlepointing himself. Well, running Needlepaint and wedding plans got the better of him and I returned in time to get it done. 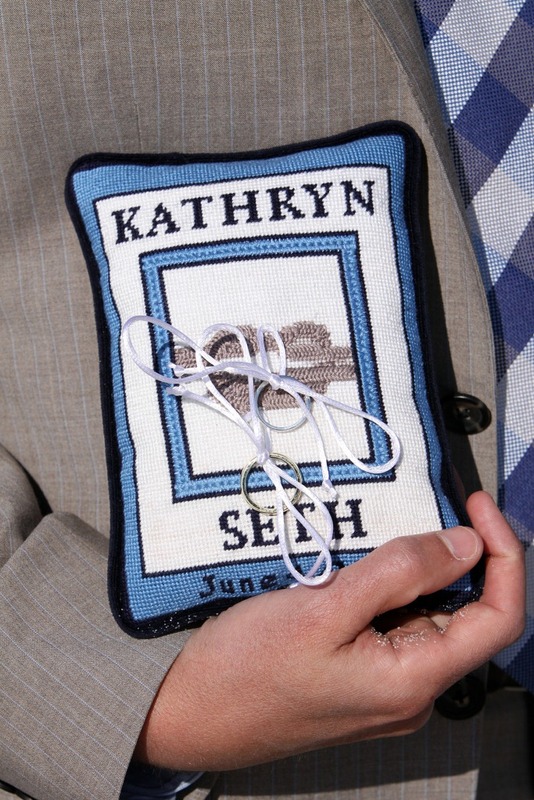 I stitched most of the needlepoint canvas with the continental stitch, and added a braided stitch to make the knot stand out and a tied stitch for the inner light blue boarder. It was fun! With the stitching completed, I headed to the local fabric store for pillow backing, polyester filling, piping, and ties for the rings. Since the wedding was to be on the beach in Cape Cod. I opted a navy backing and piping. For a more formal indoor wedding I would probably have picked a white brocade or satin. 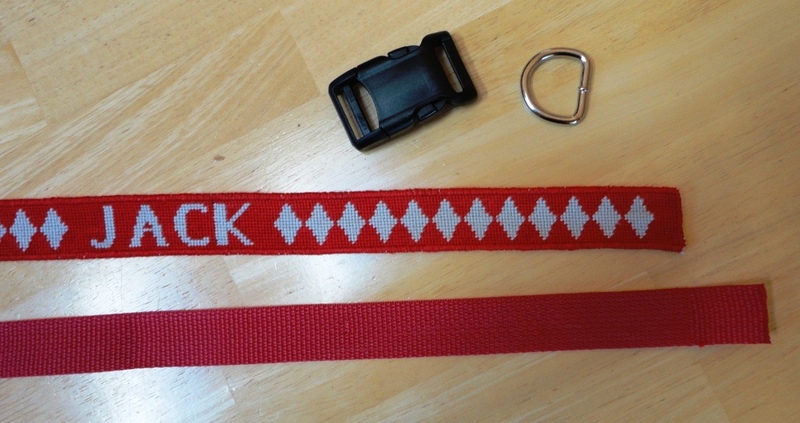 I also spent a lot of time decided on what to use for the ring ties. I was sorely tempted to get metallic cord, but it was rough and easily unraveled. The this white polyester braid worked wonderfully and looked great. It was easy to untie lest the Best Man find himself entangled in unraveling, scratchy thread. E-how has a good tutorial for how to finish your pillow. OR ADD FINISHING SERVICE……… PLEASE CONTACT US ABOUT OUR CUSTOM NEEDLEPOINT PILLOW PRICES. 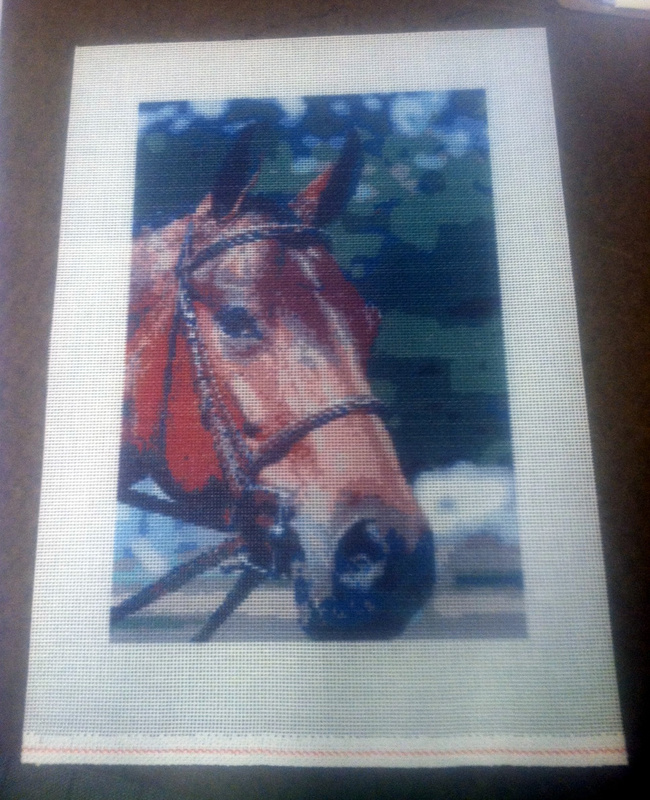 Last week, we made a really beautiful custom horse needlepoint canvas. The horse is really beautiful, and I'm looking forward to seeing it finished! You can buy this canvas at our ETSY needlepoint shop. 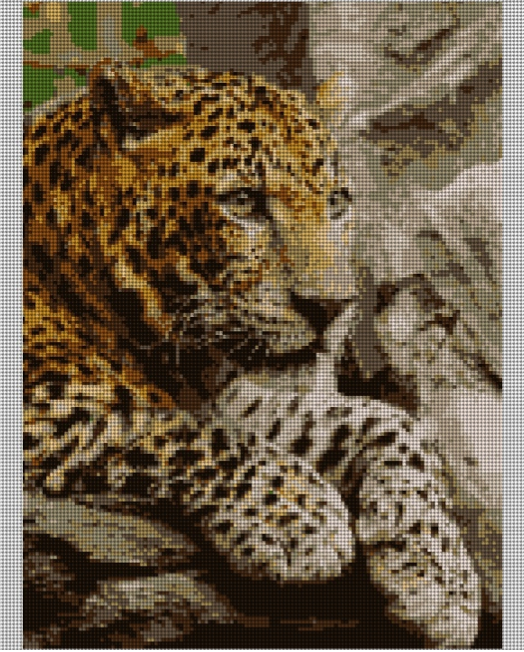 More animal needlepoint canvases are at our shop, but check out the Leopard! 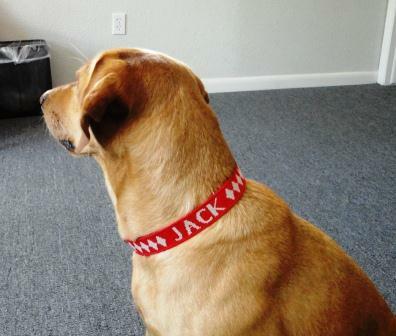 Do you like to share your needlepoint works of art with others? Then the internet is the perfect place for you. 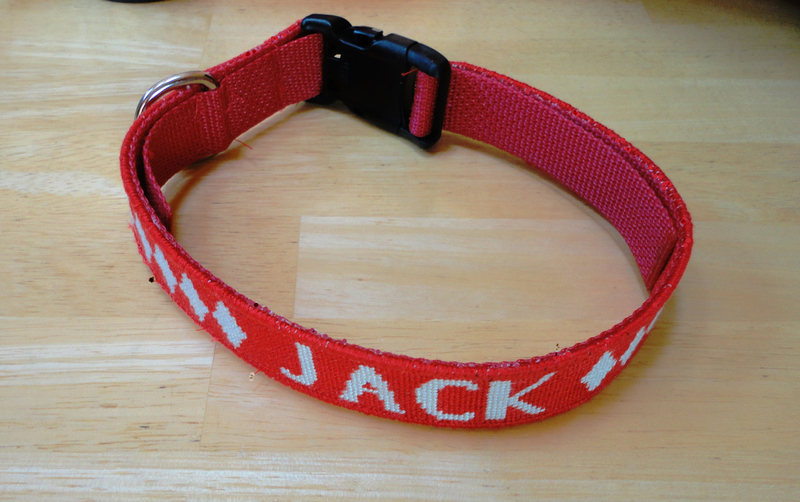 There are lots of websites now were stitchers can share their projects, needlepoint photos, and discuss new needlepoint ideas! We’ve been looking and sharing and discussing and have come up with a list of a few of our favorites: If your favorite site is not listed, please list it in the comments section or contact us. Our list is broken into 2 parts, one is for Sharing, one is for Learning and Looking. stitcherie.ning.com – This website has about 650 group members only focused on Needlepoint. It is great because it allows people to easily add their own photos and talk about them. 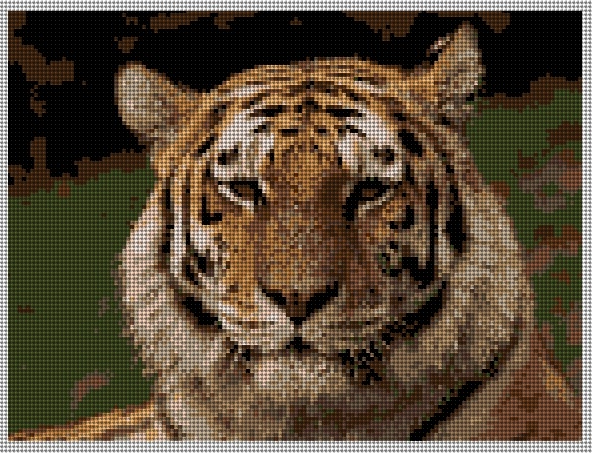 needlepoint.about.com – Cheryl Fall keeps her eyes open for great needlepoint as well as offering free stitch charts every week! nuts-about-needlepoint.com – Janet Perry has been keeping the most up to date website covering topics that will keep beginners and experts busy for months. CraftGossip.com/needlework – Denise Felton keeps readers coming back by posting beautiful needlework every day. The biggest social network in the world is a great place to connect and share your passion for stitching! Many of the sites above also have Facebook pages including NeedlePaint.